Fourth Row Center: Film Writings by Jason Bailey: In Theaters: "Another Happy Day"
To be fair, Levinson at least works his way up to that fever pitch. 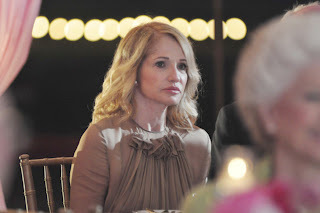 The opening scenes draw us in skillfully, introducing Lynn (Ellen Barkin) as she’s on the road to a family wedding with her two teenaged sons, Elliot (Ezra Miller) and Ben (Daniel Yelsky). Their convoluted family arrangement is explained via a home video interview, in which Elliot grills his mother about who is who’s child, living where; her son Dylan (Michael Nardelli) is from a previous marriage, and has been raised by her ex-husband (Thomas Haden Church) and his new wife (Demi Moore), but her daughter from that marriage, Alice (Kate Bosworth) has been raised by Lynn, and has in fact refused to see her father for several years. This web of grudges and estrangements provides much of the dramatic tension of the film, and though there are more artful ways of explaining it than the old “kid who’s always taping everything” routine (yes, there are plenty of “turn that camera off”s to come), the scene a) gets everything out there at once, and b) is expertly played by Barkin and Miller. He effortlessly conveys that specific and infuriating obnoxiously smug quality of late-teen boys; she establishes her helplessness and despair from the jump-off (“Don’t make this any more difficult for me than it already is”). Their relationship is the film’s most textured and nuanced, and the director and actors build their tension into a powerful explosion, played in a one-shot, unbroken scene about a third of the way in. The problem is, that scene is so stark and raw that the movie doesn’t have anywhere to go; it’s the kind of thing that should happen as a climax, not when we’re still getting exposition. Levinson quickly gets to a point where every single scene turns into a hysterical, crying shout-fest. As a result, the impact of genuinely emotional encounters is blunted (since everything is pitched at the same high volume), and more importantly, the picture’s credibility suffers. Every unhappy family may be different, but few families actually let it all hang out like this. In real families, people stifle things; they swallow them, let them go or let them simmer. Every perceived slight does not prompt a knock-down, drag-out explosion, no matter how “dramatic” that may be. Earlier scenes hint at a more recognizable reality, of little familiar cuts and jabs, and the scenes between Bosworth and Church have that unhappy discomfort down cold, but the balance is all off. Considering the fact that every role gets an aria, it’s not surprising that Levinson attracted such a distinguished cast—and, to be fair, most of them are quite good. Miller is quickly becoming one of our most interesting young actors, with a weathered, raspy voice and eyes hinting at a darkness that his vehicles don’t always take advantage of; the things he’s doing in this film’s closing shot invest the picture with a thoughtfulness that it hasn’t fully earned. Ellen Burstyn, as the passive aggressive mother, is as magnificent as ever, while Demi Moore has here (as she did in The Joneses) managed to find a role that plays to, rather than against, her by-now unavoidable plasticity. And it is nice to see George Kennedy and Diana Scarwid getting some work. Barkin is an actor who is too frequently underappreciated, and her current status as a foul-mouthed Twitter icon brings much goodwill to the picture, at least from this faithful “follower.” Levinson puts her through the ringer; it is a raw piece of work, all peaks and valleys, and she pulls off that little decathlon. But her most effective moments are her simplest (like her reception speech), and Levinson is occasionally insensitive in his editing, leaving his camera lingering on her too long in cutaways and catching her overplaying her reactions. There are good scenes and memorable performances in Another Happy Day, but it is ultimately a cripplingly undisciplined picture—all highs, all at 11, unmodulated (plus a good 20 minutes too long). Although we want to believe in it, the melodrama, the overblown emoting, and the heavy string score are ultimately too much, way too much. It’s an opera when a cantata will do. "Another Happy Day" opens tomorrow in limited release.